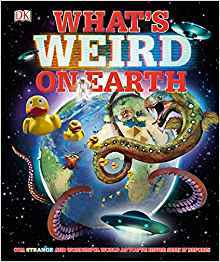 Weird and wonderful facts about our extraordinary world–like all the wind patterns on the planet or each country’s national dish or the most bizarre rock formations on each continent–are shown visually on world maps, making them easier to understand and amazing to behold. Geography, history, STEM concepts, sociology, reading, technology, and more come together in this exciting and educational atlas that presents the world’s weirdest facts visually on maps. See hidden underground waterways and ancient patterns carved in desert sand. Learn how 29,000 rubber duckies helped scientists trace ocean currents after a shipwreck. See where lightning strikes the most on Earth, and where it never strikes at all. See maps from previous centuries to understand how people perceive the planet thousands of years ago. Planet Earth will never seem the same again.